The Brooklyn Bridge has always been an icon. When its massive stone towers began rising in the early 1870s, photographers and illustrators began documenting what was considered the most daring and astounding engineering feat of the era. Throughout the years of construction, skeptical newspaper editorials openly questioned whether the project was a colossal folly. Yet the public was always fascinated by the scale of the project, the courage and dedication of the men building it, and the magnificent sight of stone and steel rising high above the East River. Below are some stunning historic images created during the construction of the famous Brooklyn Bridge. The brilliant engineer didn't live to see the bridge he designed. John Augustus Roebling was a well-educated immigrant from Germany who had already gained fame as a brilliant bridge builder before tackling what was to be his masterpiece, which he called the Great East River Bridge. While surveying for the location of the Brooklyn tower in the summer of 1869, his toes were crushed in a freak accident at a ferry pier. Roebling, ever philosophical and autocratic, disregarded the advice of several doctors and prescribed his own cures, which did not work well. He died of tetanus soon after. The task of actually building the bridge fell to Roebling's son, Colonel Washington Roebling, who had built suspension bridges while serving as an officer in the Union Army during the Civil War. Washington Roebling would work tirelessly on the bridge project for 14 years, and was himself nearly killed by the work. Drawings of the Brooklyn Bridge were first produced by John A. Roebling in the 1850s. This print from the mid-1860s shows the "contemplated" bridge. This drawing of the bridge is an accurate rendition of how the proposed bridge would look. The stone towers had arches reminiscent of cathedrals. And the bridge would dwarf anything else in the separate cites of New York and Brooklyn. Grateful acknowledgment is extended to the New York Public Library Digital Collections for this drawing as well as other vintage illustrations of the Brooklyn Bridge in this gallery. Digging away in an atmosphere of compressed air was difficult and dangerous. 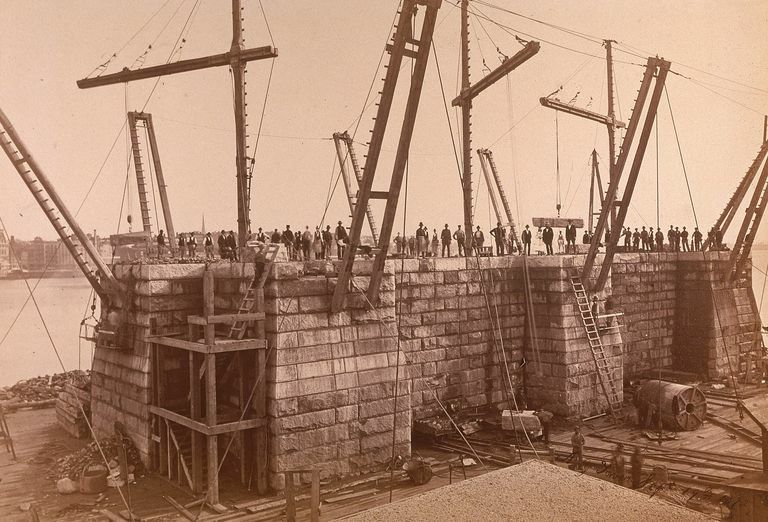 The towers of the Brooklyn Bridge were built atop caissons, which were large wooden boxes with no bottoms. They were towed into position and sunk on the river bottom. Compressed air was then pumped into the chambers to keep water from rushing in, and men inside dug away at the mud and bedrock at the bottom of the river. As the stone towers were built on top of the caissons, the men beneath, dubbed "sand hogs," kept digging ever deeper. Eventually they reached solid bedrock, the digging stopped, and the caissons were filled with concrete, thus becoming the foundation for the bridge. Today the Brooklyn caisson sits 44 feet below water. The caisson on the Manhattan side had to be dug deeper, and is 78 feet below water. Work inside the caisson was exceedingly difficult. The atmosphere was always misty, and as the caisson work occurred before Edison perfected the electric light, the only illumination was provided by gas lamps, meaning the caissons were dimly lit. The sand hogs had to pass through a series of air locks to enter the chamber where they worked, and the greatest danger was in coming up to the surface too quickly. Leaving the compressed air atmosphere could inflict a crippling ailment dubbed "caisson disease." Today we call it "the bends," a hazard to ocean divers who come to the surface too quickly and experience the debilitating condition of having nitrogen bubbles form in the bloodstream. Washington Roebling often entered the caisson to supervise work, and one day in the spring of 1872 he came to the surface too quickly and was incapacitated. He recovered for a time, but the illness continued to afflict him, and by the end of 1872 he was no longer able to visit the site of the bridge. There were always questions about how seriously Roebling's health was impaired by his experience with the caisson. And for the next decade of construction, he remained in his house in Brooklyn Heights, observing the progress of the bridge through a telescope. His wife, Emily Roebling, trained herself as an engineer and would deliver her husband's messages to the bridge site every day. The massive stone towers stood tall above the separate cites of New York and Brooklyn. Construction of the Brooklyn Bridge had begun out of sight, down in the wooden caissons, enormous bottomless boxes in which men dug away at the river bottom. As the caissons inched deeper into bedrock of New York, massive stone towers were built on top of them. The towers, when completed, rose nearly 300 feet above the water of the East River. In the time before skyscrapers, when most buildings in New York were two or three stories, that was simply astounding. In the photograph above, workers stand atop one of the towers while it was being built. Massive cut stone was towed on barges to the bridge location, and workers hoisted the blocks into position using massive wooden cranes. An interesting aspect of the bridge construction is that while the finished bridge would use novel materials including steel girders and wire rope, the towers were built using technology which had existed for centuries. The footbridge was put in place in early 1877 for the use of the bridge workers, but daring people who obtained special permission could walk across. Before the footbridge existed, one confident man made the first crossing of the bridge. The chief mechanic of the bridge, E.F. Farrington, had ridden from Brooklyn to Manhattan, high above the river, on a device resembling a playground swing. Illustrated magazines published depictions of the Brooklyn Bridge's temporary footbridge and the public was riveted. The idea that people would be able to cross the expanse of the East River by bridge seemed preposterous at first, which may account for why the narrow temporary footbridge strung between the towers was so fascinating to the public. This magazine article begins: "For the first time in the history of the world, a bridge now spans the East River. The cities of New York and Brooklyn are connected; and although the connection is but a slender one, still it is possible for any venturesome mortal to make the transit from shore to shore with safety." The temporary footbridge strung between the towers of the Brooklyn Bridge was not for the timid. The temporary footbridge, made of rope and wooden planks, was strung between the towers of the Brooklyn Bridge during construction. The walkway would sway in the wind, and as it was more than 250 feet above the swirling waters of the East River, it required considerable nerve to walk across. Despite the obvious danger, a number of people chose to take the risk to be able to say they were among the first to walk high above the river. In this stereograph the planks in the foreground are the very first step onto the footbridge. The photograph would be more dramatic, or even terrifying, when viewed with a stereoscope, the device that made these very closely paired photographs appear three-dimensional. What gave the bridge its enormous strength were four suspension cables made of heavy wires spun together and anchored at either end. This illustration of the Brooklyn anchorage of the bridge shows how the ends of the four massive suspension cables were held in place. Enormous cast-iron chains held the steel cables, and the entire anchorage was eventually encased in masonry structures there were, all by themselves, enormous buildings. The anchorage structures and the approach roadways are generally overlooked, but if they had existed apart from the bridge they would have been noteworthy for their great size. Vast rooms under the approach roadways were rented out as warehouses by merchants in Manhattan and Brooklyn. The Manhattan approach was 1,562 feet, and the Brooklyn approach, which began from higher land, was 971 feet. By comparison, the center span is 1,595 feet across. Counting the approaches, the "river span," and the "land spans," the entire length of the bridge is 5,989 feet, or more than a mile. The cables on the Brooklyn Bridge had to be spun high up in the air, and the work was demanding and subject to the weather. The four suspension cables on the Brooklyn Bridge had to be spun of wire, meaning that men worked hundreds of feet above the river. Spectators likened them to spiders spinning webs high in the air. To find men who could work up in the cables, the bridge company hired sailors who were used to being in the tall rigging of sailing ships. Spinning the wires for the main suspension cables began in the summer of 1877, and took a year and a half to complete. A device would travel back and forth between each anchorage, placing wire into the cables. At one point all four cables were being strung at once, and the bridge resembled a gigantic spinning machine. Men in wooden "buggies" would eventually travel along the cables, binding them together. Besides the difficult conditions, the work was exacting, as the strength of the entire bridge depended on the cables being spun to precise specifications. There were always rumors about corruption surrounding the bridge, and at one point it was discovered that a shady contractor, J. Lloyd Haigh, had been selling shoddy wire to the bridge company. By the time Haigh's scam was discovered, some of his wire had been spun into the cables, where it remains to this day. There was no way to remove the bad wire, and Washington Roebling compensated for any deficiency by adding 150 extra wires to each cable. The completion and opening of the bridge was hailed as an event of historic magnitude. This romantic image from one of New York City's illustrated newspapers shows the symbols of the two separate cites of New York and Brooklyn greeting each other across the newly opened bridge. On the actual opening day, May 24, 1883, a delegation including the mayor of New York and the President of the United States, Chester A. Arthur, walked from the New York end of the bridge to the Brooklyn tower, where they were greeted by a delegation led by Brooklyn's mayor, Seth Low. Below the bridge, US Navy vessels passed in review, and cannons in the nearby Brooklyn Navy Yard sounded salutes. Countless spectators watched from both sides of the river that evening as a massive fireworks display lit the sky. The newly opened Brooklyn Bridge was a marvel of its time, and illustrations of it were popular with the public. This elaborate color lithograph of the bridge is titled "The Great East River Bridge." When the bridge first opened, it was known as that, and also simply as "The Great Bridge." Eventually the name Brooklyn Bridge stuck. When the bridge first opened, there were roadways (one going in each direction) for horse and carriage traffic and railroad tracks which took commuters back and forth between terminals at either end. Elevated above the roadway and railroad tracks was a pedestrian walkway. The walkway was actually the site of a great tragedy a week to the day after the bridge opened. May 30, 1883 was Decoration Day (the precursor of Memorial Day). Holiday crowds flocked to the bridge, as it afforded spectacular views, being the highest point in either city. A crowd got very tightly packed near the New York end of the bridge, and panic broke out. People began to scream that the bridge was collapsing, and the crowd of holiday revelers stampeded and twelve people were trampled to death. Many more were injured. The bridge, of course, had been in no danger of collapse. To prove the point, the great showman Phineas T. Barnum led a parade of 21 elephants, including the famous Jumbo, across the bridge a year later, in May 1884. Barnum pronounced the bridge to be very strong. Over the years the bridge was modernized to accommodate automobiles, and the train tracks were eliminated in the late 1940s. The pedestrian walkway still exists, and it remains a popular destination for tourists, sightseers, and photographers. And, of course, the bridge's walkway is still quite functional. Iconic news photos were taken on September 11, 2001, when thousands of people used the walkway to flee lower Manhattan as the World Trade Centers burned behind them. This advertisement for a sewing machine company indicates the popularity of the newly opened Brooklyn Bridge. During the long years of construction, many observers derided the Brooklyn Bridge as a folly. The towers of the bridge were impressive sights, but some cynics noted that despite the money and labor going into the project, all the cities of New York and Brooklyn had gained were stone towers with tangles of wires strung between them. On opening day, May 24, 1883, all that changed. The bridge was an instant success, and people flocked to walk across it, or even just to view it in its finished form. It was estimated that more than 150,000 people crossed the bridge on foot on the first day it was open to the public. The bridge became a popular image to use in advertising, as it was a symbol for things people respected and held dear in the 19th century: brilliant engineering, mechanical strength, and a tenacious devotion to overcoming obstacles and getting the job done. This lithograph advertising a sewing machine company proudly featured the Brooklyn Bridge. The company really had no connection to the bridge itself, but it naturally wanted to associate itself with the mechanical wonder spanning the East River.